I talked before about how to get out of the creativity rut, how to tweak your photographic creative approach to get the mojo back. And I said I&apos;d share some of my crappy images, just to show how plodding through the downtime will eventually help you escape to the other side. Part of the keep shooting, even if it&apos;s crap idea, is that you should continue taking photos of the things that usually work for you. For me, it&apos;s shadows. I often look for the way they create intersting textures or shapes, so when I saw this circle against the hard rectangular lines, I knew I had to capture the juxtaposition. I know there was a photo in that somewhere, but not in the way I took it. Same with the shadows from a traffic light casting their gaze over the doorway. There&apos;s an image there somewhere, with the leading lines, erm, leading directly to the entrance-way, and the clean, white surrounding wall suggesting a sanctuary of some-sorts. It hasn&apos;t quite worked out, but remember, the whole point of "keep shooting" is to take photos regardless of the outcome. I love these pipes. Or whatever they are. I pass this building every day, and I love the way the light and shadow play with each other around the curves of the shafts. Yeah, shafts; that&apos;s what they are. Whenever I take photos of buildings, I try to have at least one edge following or parallel to one of the major diagonals (the baroque or sinister), and sometimes it gives a dutch angle composition, but not on this one. This one looks almost presentable. Oh my gawd, I&apos;ve only gone and done a colour photo. Sorry about that. I love chimney pots and old tv aerials; a remnant of the past, neither roof adornmant being useful in the modern city of gas central heating and fibre optics. They still sit atop our urban skylines, watching guard as we sleep. I usually shoot them in silhouette, but this time I just enjoyed the contrast of the orange chimney pots and blue sky. This doesn&apos;t feel like a great photo to me, not like the usual dark silhouetted urban skylines that I&apos;ve taken in the past. I love to practice composition whenever I take a photo. It doesn&apos;t always work out right. This is one of those shots. There&apos;s a stark contrast between the blacks and the whites (I love a good contrast, deep blacks and bright whites), which gives a good sense of figure/ground ratio. And the right hand edge of the wall matches up with the reciprocal diagonal. And the left hand corner of the wall is close to squaring off the image. But other than that I don&apos;t feel the image works. Yes, there&apos;s a sense of importance around the "Argyle Metals" sign, but the image as a whole doesn&apos;t tell enough of a story to me. Though I have to say I love the intrigue of the sloping viaduct in the background, adding an element of tension! And down to the beach. I guess I&apos;m really lucky to live in Brighton, so close to the sea. There&apos;s always something going on in the city. For this composition, I wanted to play with the parallel lines of the walls and horizon and promenade, juxtaposing (there&apos;s that word again) with the lifeguard umbrella. Then the girl popped up out of nowhere. She actually added to what would have been a truly dull photo. But it&apos;s still nothing to be proud of; it&apos;s still a meh kind of snapshot. The beauty of having your camera with you wherever you go means you&apos;re always ready for the unexpected, candid shot. I like this one. 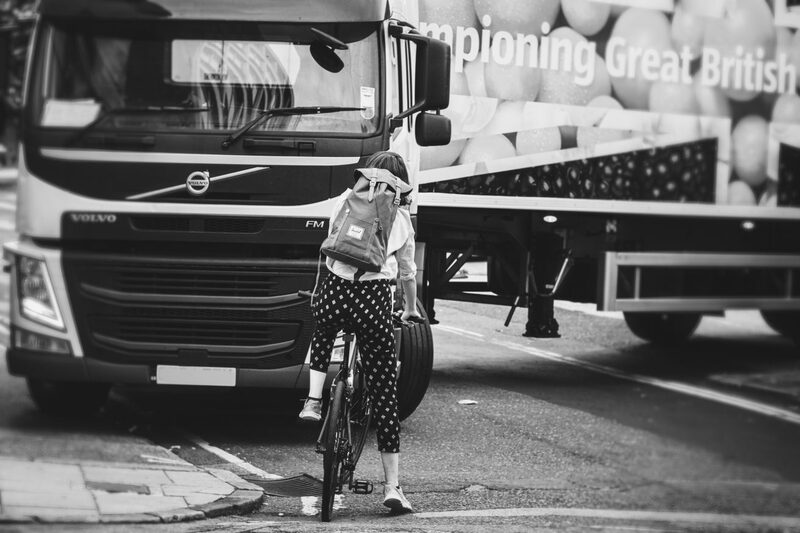 The cyclist not realising the lorry cannot move without her moving first, but she wants the lorry out of her way so she can pass. Eventually a passer-by explained her predicament. Good on the lorry driver, he was patient and didn&apos;t shout or rant or intimidate. He sat patiently. I love taking candid shots, but this one had to be cropped. But even then, it still doesn&apos;t capture the feeling, the emotion of what was happening. It doesn&apos;t quite capture (not in my mind) of what was happening for both parties that day. Having said that, I don&apos;t know what I could have done to make it better. The composition is crap, but I don&apos;t know how I could have improved it. Walking around the scene might gave helped, but the moment would have changed in an instant, so I had to be quick with the capture. And at the end of it, the creativity gods will shine down on you. This one I did enjoy. The composition works wonderfully, the legs matching the baroque diagonal, the white legs and chair contrasting against the grey concrete and dark shadows to give good figure/ground relationship, sufficient negative space to give the legs room to breathe. It may not win awards, but as a candid capture it pleases me. And when it comes to getting the creative mojo back, that&apos;s all that matters, doesn&apos;t it?